Honesty is always the best policy. When we have a litter or started dog for sale, we try to be as honest as possible about their strengths and weaknesses. If anything, we'll be a little too critical of our dogs, rather than "play them up" to impress a buyer. As breeders, we are breeding for ourselves and not for the public market (i.e. - we're not breeding just to sell puppies), so we are very selective in where we place our puppies and dogs. We ask a lot of questions of potential buyers, not because we are nosy, but because we want to ensure our dogs will be a good match for the buyer and be in exactly the right environment needed for that specific dog. We require that every buyer meet us in person, so they can see how our pups are raised, and so we can a good understanding of what that buyer is looking for in a dog. If you are looking for a "click and buy" breeder, you've hit the wrong website. We do not have any English Setter puppies available at this time. But please check out our adorable foster puppies available through A Better English Setter Rescue! 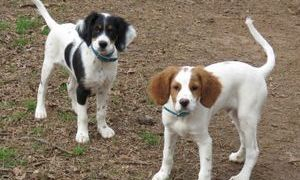 Bob (tri-color) and Otto (orange/white) are adorable English Setter/Brittany mix puppies. They were born the beginning of October, 2019. Both boys are sweet and affectionate. You can pursue adoption by contacting A Better English Setter Rescue. 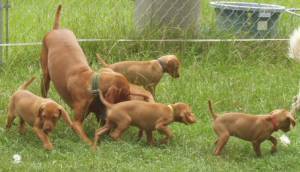 We currently have no Vizsla pups available, and no plans for a litter within the next year. If you are interested in purchasing a Vizsla or English Setter from another responsible breeder, try contacting the American Kennel Club (www.akc.org) for a breeder referral, or use the breed's Parent Club as a source. We work with various dog Rescue groups. There are often adult Vizslas or English Setters that need new homes due to their previous owner's inexperience with the breed, divorce, major life changes, etc. These dogs deserve a second chance at a happy home. The nice thing about a rescued dog is they often come to you already housetrained, crate-trained, finished with the chewing and other "puppy" behavior, and some even have basic obedience training! Yes, they might have a little "emotional baggage" - but don't we all? Dogs are highly adaptable creatures and quickly bond with their new owners.